South Korea’s government on Tuesday reconfirmed its plan to improve the decision-making process of the National Pension Service but concerns continued to build up in the market on whether the fund operator may overcome its prolonged leadership vacuum and fund depletion. Boosting the market anxiety was an ongoing brawl over a top presidential aide’s alleged intervention in the personnel appointment of the NPS, an issue which clouded the pension operator’s purported independence and transparency. “The investment management committee of the NPS is slated to hold its meeting on July 26 or 27 to review and decide on the plan to introduce the stewardship code,” a senior official of the Ministry of Health and Welfare said Tuesday. The ministry’s reiteration came in response to the growing speculations that the NPS may postpone the adoption of the stewardship code for the state pension fund, due to the controversial search process of its chief investment officer and several vacancies in its key positions. The stewardship code refers to a set of guidelines seeking to drive institutional investors to engage more actively in corporate governance for the best interests of the fund beneficiaries. The system is currently adopted by some 20 countries around the world, including the United States, Australia and Japan, according to the ministry. The idea took shape in December last year amid sharp criticism over the fund operator’s approval of Samsung Group’s disputed merger of its two key units -- Samsung C&T and Cheil Industries -- back in 2015 under former President Park Geun-hye. The decision, which was seen as a result of political pressure, was reported to have caused a 28 percent loss in the NPS funds, according to industry tracker Chaebul.com. Despite its massive amount of funds and stakes in a number of local firms, the fund operator has frequently been under fire for rubber-stamping agendas at shareholders’ meetings, catering to the interests of large shareholders. 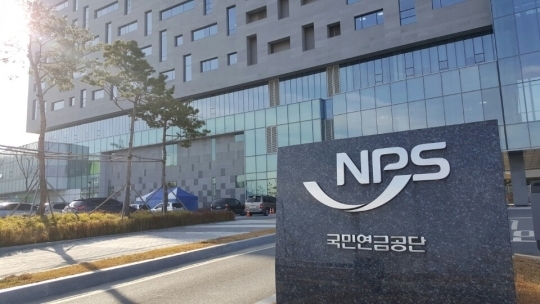 Currently operating more than 600 trillion won ($537 billion), the NPS is one of the three biggest pension operators in the world, as well as the single-largest state pension program operator to provide post-retirement income and coverage for disabilities. President Moon Jae-in had promised during his election campaign to reform the country’s corporate governance by reinforcing the decision-making process of the NPS. Clouding the initiative, however, was the recent claim that Presidential Chief of Staff for Policy Jang Ha-sung had exerted influence on the selection process of the CIO position of the NPS. The presidential office Cheong Wa Dae denied the claim, but anxiety escalated on the operating stability of the NPS as its key posts including the CIO continued to remain vacant amid the disputes and the fund return plunged amid such leadership vacuum. The NPS’ earnings in January-April this year stood at 0.89 percent, according to its official notice on Monday. The figure translates into a yearly figure of 1.66 percent, which is less than a quarter of last year’s total earnings of 7.28 percent. Also, a report recently issued by the Korea Institute for Health and Social Affairs claimed that the NPS funds will run out in a faster-than-expected rate and near exhaustion by year 2058, two years earlier than government estimation. Upon such predictions, the institute suggested an incremental hike of the pension insurance rate in the upcoming years.